BEVERLY HILLS, Calif. – The big TV in the big room in the big building showed the Pistons losing another high-stakes, late-season basketball game back in Detroit. “Arrgghh!” said team owner Tom Gores, when the outcome was final. This was two weeks ago at the Platinum Equity compound in Southern California, home base of Gores, the billionaire from near Flint. Platinum Equity is his global, private investment firm. It’s worth at least $13 billion, a number that rises and falls with the whims of the market and the size of its portfolio; Gores’ personal fortune is estimated at $4.1 billion, a number that, judging from the way he lives, constantly rises. As Gores took a guest on a tour of the Club Room, in an edifice that resembles an embassy (a low-slung white building with Greek columns and, this being southern California, splashing fountains here and there), he was asked how important it would be for his team to make the playoffs this season. In eight years of Gores’ ownership, this would be their second qualification; the first was in 2016. Gores told of a recent text message he sent to Dwane Casey, Detroit’s first-year head coach. 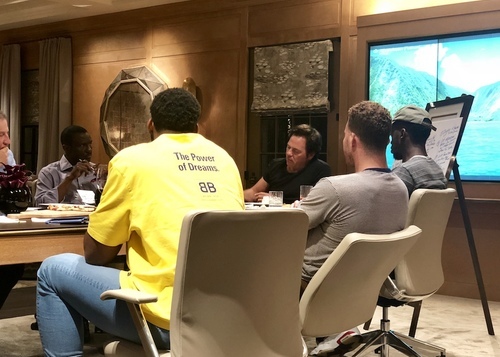 After expressing pride in Casey and the players for the “great story” of how they fought adversity during the 2018-19 season, Gores added a final thought. Be careful of what you wish for. Gores was among horrified courtside witnesses Sunday night when the Bucks, in the first round of the playoffs, crushed the Pistons, 121-86, in Game One of the best-of-seven series that resumes Wednesday night in Milwaukee at the Fiserv Forum. Adding to the embarrassment was the ejection of Detroit center Andre Drummond in the third quarter for flinging to the floor Bucks’ superstar Giannis Antetokounmpo, known as The Greek Freak. Adding a technical foul was Pistons’ superstar Blake Griffin – in street clothes, on the bench, due to a knee injury. Despite Sunday’s humiliation, the Pistons are the only Detroit pro sports team to make the playoffs since the end of the 2016 football season. That pleases Gores, who considers himself just a down-to-earth, 54-year-old guy from Michigan State who combines a Midas touch with the common touch. 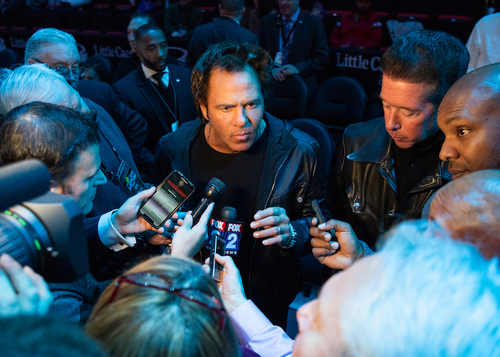 Often criticized as an “absentee owner” on sports talk radio and the internet, Gores attended Pistons’ victories Tuesday in Detroit and Wednesday in New York. He saw his team clinch that precious playoff berth against the Bucks. Gores also may have had other business in New York, what with his serious bid to buy Fox Sports Detroit and all its regional cousins around the nation. He’s a busy man with deals to do. Gores and his five siblings are immigrants, having arrived with their parents in 1968 from Nazareth, Israel. (The family name is pronounced as two syllables: GOR-ess.) The Six-Day War the year before had reordered the region, and the family, who are Christian, thought the U.S. might be a better place for them. Tom Gores at his father's former store in Flint. Tom is the second-youngest of the six, with a Lebanese mother and a Greek father. His father, Charlie, spoke seven languages, but when the family moved to America, they settled in Genesee Township, just outside Flint, where Charlie ran a small grocery store. Gores was four years old. Gores describes his father as a realist who balanced the family checkbook before shopping to stay within their budget. "I'm pretty intuitive. I mean, I see things. I just do. I listen to the little nuances of things. And maybe the reason I'm also very aware of body language and being accepting and encouraging is because I see a lot of it. Energy is important. How you give your energy to a person is important." Private equity made Gores a billionaire, but private equity can be murky. Basically, private equity firms attract investors to buy (or buy into) companies and use their influence to change the way they operate, sometimes by reorganization, selling off divisions, or flipping them to new owners. Platinum Equity currently has 37 companies in its portfolio, although that number can move up or down in short periods of time. What, exactly, do they do? One makes wind turbine components. Another constructs “cloud architecture systems.” One makes school yearbooks. Yet another distributes products to monitor blood glucose. There’s one that provides portable toilets and one, Securus Technologies, runs prison telephone systems – a recent acquisition that has brought criticism to Platinum and to Gores and a promise of reform. His work merges with his hobbies, and his hobbies make money. He buys and sells mansions in Beverly Hills the way some people might flip Boardwalk or Park Place on the Monopoly board. Which raises the question: Where do the Pistons fall in this universe? Because at the moment, they’re an underachieving business, although the series against Milwaukee will raise both their revenue and their profile. 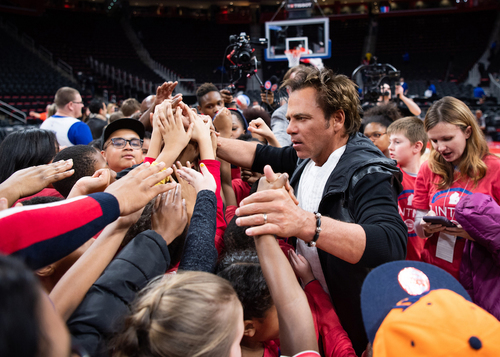 Although the value of Gores’ team has nearly quadrupled during his ownership, some of his basketball bottom lines suggest money left on the table. For instance: Although the worth of the Pistons has grown from $325 million to $1.27 billion under Gores, the Pistons rank only 26th in value in a 30-team league, according to Forbes. That’s barely ahead of 30th place Memphis ($1.2 billion) and far behind the first-place Knicks ($4 billion). The Pistons’ announced home average of 16,486 is 24th in a league led by Philadelphia at 20,447, according to totals compiled by ESPN. And, in terms of seats sold as a percentage of arena capacity, the Pistons rank last at 78.5. And that figure is based on officially announced attendance figures. At some Pistons’ “sellouts” of 20,768 there are wide expanses of empty seats, particularly in the upper deck, as was the case last month for the visit of the Los Angeles Lakers. To change that image in the last quarter of the season, the Pistons discounted some prices and eliminated the large “service fees” so common to ticket sales in the digital era. It helped increase crowd size. And, at the insistence of the Pistons, the seats themselves are changing color from red to black in the two-year-old LCA because of how they look on television when empty. One of Gores’ Platinum partners, Mark Barnhill, said the change in upholstery came after negotiations with Olympia Entertainment, the Red Wings and the Ilitch family with whom they share the LCA. One person who isn’t in those seats very often is Gores himself. The team owner uses his center-court chair for only about a half-dozen home games each season. But he rejects the criticism of what he called “my presence.” Gores said the amount of time he spends on his team is “as high as anybody else” on his ownership level. “But I don’t think I need to prove it by sitting in the stands or anything,” he said. When Gores does visit the LCA, he makes his presence known. During timeouts, he helps staffers throw T-shirts to fans. The LCA basketball floor shows the cursive logo of Platinum Equity in two prominent places. At one of his rare visits – after a lackluster victory over Dallas – Gores left his chair and photo-bombed an interview between Drummond and Johnny Kane of Fox Sports Detroit. But that wasn’t all. With perspiration glinting under the lights on Drummond’s skin, Gores wrapped his arms around him, hugged him and performed an elaborate handshake ritual with his star. Asked about it weeks later, Gores explained his affectionate style. 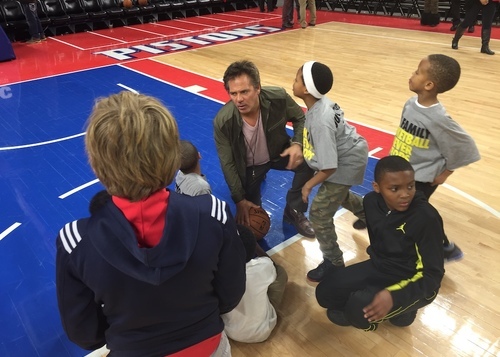 Now commanding his third Pistons management team in eight seasons, Gores told his brass at the trading deadline – in person, on a visit to Detroit – to make deals to improve the current roster and to try to reach the playoffs rather than accept the defeats that might lead to a higher choice in the NBA draft. Around his team, Gores shows his sunny side. Drummond is the team’s best rebounder at 15.6 per game. Forward Blake Griffin leads the scorers at 24.5 points. He also said Gores keeps in touch. Gores lured veteran shooter Wayne Ellington to the Pistons in February after Phoenix bought out his contract. After speaking with Ellington on the phone, Gores asked to talk to Ellington’s wife, who is Lebanese, like Gores’ mother. Gores also turned on the charm when wooing Casey last summer after Casey won Coach of the Year honors with Toronto. According to vice-chairman Arn Tellem, Casey visited Gores in Beverly Hills with Tellem and senior advisor Ed Stafanski. Stefanski and Tellem defeated the owner and the new coach. “So Tom and Casey had to get on the floor,” Tellem said. While running a basketball franchise is not without its problems, it is a pleasant distraction from more serious business matters in the Gores universe. Last week the Federal Communications Commission rejected an attempt by a Platinum company – Securus Technologies of Texas – to merge with another prison telephone company called Inmate Calling Solutions. Opponents argued that such a merger would allow Securus a dominant share of a business which, critics said, exploits a poor, vulnerable and captive market by charging high rates for phone calls from behind bars. Securus is also being sued in Massachusetts for what is alleged to be a “kickback scheme” between the Bristol County Sheriff’s Office and Securus, according to Brian Highsmith, attorney for the National Consumer Law Center. Rather than express defensiveness about the business practices of Securus, both Gores and Barnhill vowed that Platinum understands the crisis and will rebuild Securus with new ideas. “What we’re trying to do now that we’re learning more about it is be reformists,” Gores said. Another legal matter – also involving telephones – still vexes Barnhill and others close to Gores more than a decade after it was revealed. It was an entanglement with Anthony Pellicano, the Hollywood private investigator who was released from prison just last month after serving time for illegal wiretapping and other crimes. During Pellicano’s trial in 2008, it was revealed that he recorded a conversation in 2000 between Gores and Lisa Gores, who was then married to one of Gores’ brothers, Alec. Tom Gores after a Pistons game. Alec and Lisa soon divorced, but Alec and Tom remain on good terms. Tom often stresses to others his belief in family bonds and lasting relationships and trust. He makes no apologies for earning his way into the “one percent,” but he said he strives to stay humble and remember he was a poor kid from Flint. He added that “we’ve got to figure out a way” to get people out of downward trajectories, and that providing inspiration might be part of his role. In a long interview, the words “human” and “humanity” come up often. His original first name in Arabic – Tewfiq – is said to mean luck or good fortune. Gores said he always heard that but never checked it out. He’s a toucher, a hugger, guiding his guests through his kingdom with touches on the shoulder and elbow. It’s a family thing, he says; there was lots of hugging back in Genesee, and he uses physical touch as part of his charm. He notes that the Club Room at Platinum Headquarters is larger than the first family home in Flint. As for his current dwellings, he owns four – two in California (Beverly Hills, Malibu) and two in Michigan (Birmingham, Grosse Ile). He dresses California casual, and stays California fit. But he still has Michigan friends. Gores stays in close touch with Ethan Davidson, son of the late Pistons’ owner Bill Davidson, who died in 2009. Gores bought the team from the Davidson estate, controlled by Bill’s wife, Karen. In some ways, their friendship represents a passing of the baton for a sports franchise that is part of NBA bedrock, just as the Tigers, Lions and Red Wings are in baseball, football and hockey. Although the junior partner among the four locals, the Pistons are the third oldest team in their league, trailing only the Boston Celtics and New York Knicks in terms of the same team with the same name in the same place. And Gores is just their third owner. Before Bill Davidson came Fred Zollner, who moved the team from Fort Wayne in 1957; they were originally named for Zollner Piston, Fred’s company in Indiana. The younger Davidson noted how Gores differs from the sort of NBA owners in place when his father bought the team in 1974. “A lot of the teams were still owned by car dealers,” Davidson said. Davidson recalled how Gores called him one day, while he was trying to buy the Pistons, and promised to fly immediately from New York to Detroit to meet him. Davidson – a singer-songwriter – was about to go into a recording session. He asked Gores to try back at a different time. Instead, Gores flew to Detroit and took a car to the recording studio. Davidson could not then negotiate on behalf of his father’s wife. But he handed Gores a tambourine and let him sit in on a few tracks. The sale came later and they stayed in touch. Davidson said his father did not find great success in basketball in his first years as an owner, and implied that Gores and his Platinum associates might have experienced a similar learning curve. Davidson said he was wary, at first, of Gores’ warm approach. Davidson said Gores gets a bad rap for absenteeism. Gores did just this after last month’s victory over the Lakers. Gores walked out onto the playing floor with Holly, Davidson’s family and dozens of others to mingle in a post-game shoot-around with basketballs and cameras. Among the guests were 50 students from Doyle Ryder Elementary School in Flint. Gores stayed for about an hour and was clearly enjoying the scene. He posed for pictures with some MSU students and anyone else who asked. He greeted Dr. Mona Hanna-Attisha, the water-crisis whistleblower, and others from the United Way of Genesee County. He slapped shoulders, patted backs, and hugged and squeezed his way around the crowd. Reflecting last week on his visits to Detroit, he seemed almost rueful about how his good works might get overlooked when his team, a prized possession, is mediocre, as it was this season, at 41-41.